Huma Abedin, in tandem with Hill (her joined-at-the-hip gal pal), was front and center at the onset of this site. It was not an accident. PLEASE recall the time frame, it was more than germane. Still is. Yes, it coincided with the terrifying likelihood that the Islamist-in-Chief would gain a second term, as well as Hill being able to continue her (mis)reign as Sec. of State. Mind you, this all came into play only 3 months before Benghazigate blew up, a hardly incidental point of reference. What? Well, it was at this most “opportune” time that Huma Abedin “conveniently” flew out of line of fire at the State Dept, only to re-emerge and continue her work as a “special government employee.” Hmm. How fortuitous. Ms. Abedin declined a request for an interview, but the picture that emerges from interviews and records suggests a situation where the lines were blurred between Ms. Abedin’s work in the high echelons of one of the government’s most sensitive executive departments and her role as a Clinton family insider…..
Ms. Abedin reached her new working arrangement in June 2012, when she returned from maternity leave, quietly leaving her position as deputy chief of staff and becoming a special government employee, which is essentially a consultant…..
NOT only that, but the evidence soon became overwhelming that the empowerment of the Muslim Brotherhood – through a mega weapons smuggling operation – was a main focal point for blowing apart Libya. So, how likely was it that a major Muslim Brotherhood (Sisterhood) player was in the dark about this operation, but had no hand in its implementation, like Hill, whose hands steered State’s wheel at the behest of Barack HUSSEIN Obama? NOW that Huma’s tenure…now you see her, now you don’t…at State has become clearer, it is time to paint an additional Islamic picture, regarding her infiltration and penetration into America. Coin it, from henceforth, her “House of Saud undercover” operation! Sura 5:60 – Then say: “Should I inform you [People of the Book] of those, who will have even worse recompense from Allah than the transgressors? They are those whom Allah has cursed; who have been under His wrath; some of whom were turned into apes and swine; who worshipped taghut [the devil or idols]; those are the people who are in a far worse plight and who have turned farthest away from the Right Way.” (Maududi)….etc. Question: Why does Islam not allow Muslim women to marry Christian or Jewish men while it allows vice versa? Quite often non-Muslims raise the question as to why does Islam not allow Muslim women to marry Christian or Jewish men while it allows Muslim men to marry Christian or Jewish women. THUS, if we are to assume that Huma is a female, yet she married a Jew and had his child too, isn’t it VERY clear that she VIOLATED a basic tenet from the Quran? Concomitantly, isn’t it also the case that her family, a highly religious and prominent one within Saudi Arabia, the Wahhabi Kingdom – their history can be accessed here – would have disowned her or worse? RESULTANT, according to this recap, isn’t Huma Abedin being given “special” dispensation? Of course. The question becomes two-fold: by whom, and to what end? Saudi Arabia isn’t just governed by a strict interpretation of sharia law. It prohibits the public practice of any other religion; it is also Judenrein. Apostasy is considered much worse than being a Jew and is worthy of death. A Muslim woman marrying a Jew is about the most unspeakable crime a Saudi woman can commit. That is what makes the recent trip of close Hillary Clinton adviser Huma Abedin to Saudi Arabia quite inexplicable if she is not a spy for the Muslim Brotherhood. 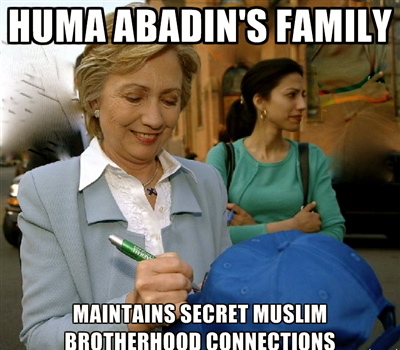 Joining Huma in what should have been seen as a dishonor to the family was Huma’s sister Heba Abedin. Instead, Huma traveled to Saudi Arabia without fear of death for her crime. Despite being married to Anthony Weiner (a Jew), Huma Abedin (a Muslim) was allowed to travel to Saudi Arabia to witness her mother Saleha being honored by Dar al-Hekma University, where Saleha works as a Vice Dean. As a leader with the Muslim Sisterhood, Saleha should have been dishonored by her daughter’s marriage four years ago. Yet, Huma is permitted to attend the honoring of her Muslim Sisterhood mother at a Muslim fundamentalist University. Once again we see evidence that Huma is an agent of the Brotherhood, not the innocent, moderate Muslim she is portrayed as being…. According to the Saudi brand of Sharia law, Huma dishonored her family when she married Weiner. At a minimum, she should have been disowned by the family. That she was not means that the family dishonored itself. In other words, Saleha and Heba further dishonored the family. Since Dar al-Hekma decided to honor Saleha anyway means that the University dishonored itself. Of course, all of this is forgiven if Huma is practicing Muruna by using the tactic known as the Doctrine of Balance. TO wit, know their Islamic tactics well, your very lives depend on this knowledge base! In essence, in order to understand what is going on under the radar, taqiyya, kitman, tawriya, muruna, etc. are the places to commence your journey. Get busy. MOST significantly, while she has access to the deepest repository of America’s national security secrets – never mind that she is no longer “employed” by the State Dept. – she enjoys the protective shield of Barack HUSSEIN Obama, Bonnie and Clyde Clinton, scores of Beltway power brokers, and the entire Brotherhood apparatus! Whoa, Nellie. NOW, you tell this investigative journalist: does it get any more dangerous than that? AND, as an exercise in journalistic curiosity, the captured media should (but they won’t) ask Huma the following “yes or no” queries with no hemming and hawing in between: is she “for or against” what the latest female jihadi (from Colorado) tried to do, as “Jihad Shannon” attempted to board a flight from Denver International Airport to Turkey, not as a sightseer, but to join up with the Islamic State? If not, why not? INDEED, the above questions (begging for answers) should just get the (media) ball rolling ! This entry was posted in Uncategorized and tagged "Jihad Shannon", Benghazigate, Bonnie and Clyde Clinton, http://islamexposed.org/2015/01/25/muslim-brotherhoods-huma-abedin-penetratedinfiltrated-america-the-house-of-saud-what-are-the-ramifications-commentary-by-adina-kutnicki/, http://www.israelsvoice.org/2015/01/24/muslim-brotherhoods-huma-abedin-penetratedinfiltrated-america-the-house-of-saud-what-are-the-ramifications/, Huma Abedin, Huma Abedin's "dossier", Muruna/Tawriya/Kitman/Kitman, MUslim Brotherhood, Muslim woman marrying a Jew is about the most unspeakable crime a Saudi woman can commit, not permissible for a Muslim woman to marry a kaafir (non-Muslim), six degrees of separation, Sura 7:166: Sura 2:65: Sura 5:60 etc. = Jews become "apes and swine", Wahhabi Kingdom by Adina Kutnicki. Bookmark the permalink. Pingback: Israel's Voice | Muslim Brotherhood’s Huma Abedin Penetrated/Infiltrated America: The House of Saud! What Are The Ramifications? Interesting article. However, am concerned here that your Koranic quotes don’t appear to refer to Jews; only you say they do, The seem to refer to ‘animal’ or not observing spitritual/religious ‘proscriptions’, such as fidelity in marriage, prayer, remembrance, etc.